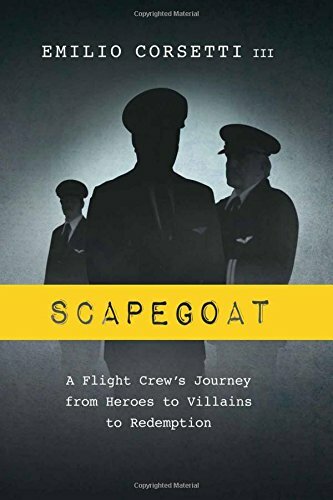 Article first published as Book Review: ‘Scapegoat: A Flight Crew’s Journey from Heroes to Villains to Redemption’ by Emilio Corsetti, III on Blogcritics. “Scapegoat” by Emilio Corsetti III, tells the story of a Boeing 727 known in aviation circles and media accounts as “the plane that fell from the sky.” In 1979 while 39,000 feet over Michigan, flying from New York to Minneapolis, TWA Flight 841 went into an uncontrollable spiral and 360° rollover. The plane nose-dived to near ground level before the pilot regained control and completed an emergency landing in Detroit. The opening chapters are riveting as a re-creation of the vertical descent, through the eyes of the passengers and crew. Investigators were left with imperfect Boeing simulators and tests on other similar aircraft to determine whether mechanical failure was the cause. In addition, when they couldn’t find any mechanical cause, investigators were all too quick to blame the crew. There was no evidence that the crew did anything wrong, but somehow, and sometime, during the near-catastrophic dive, the cockpit voice recorder was erased. Investigators assumed that a crew member intentionally erased the recording and, therefore, that the crew had something to hide. Thus, the investigators simply would not believe anything the crew had to say. “Scapegoat” is a scathing indictment of nearly everyone involved in the investigation, particularly the NTSB and Boeing. They quickly reached a conclusion – that the pilot and crew were hiding something – and ignored or minimized any evidence that suggested otherwise. “Scapegoat” is also critical of the media, which preferred a quick answer to the mystery to a delayed, but more accurate one. Media outlets put out theories based on snippets of information or misinformation and rarely put forward a thoughtful or thoroughly researched analysis. The book does an excellent job of taking the reader through the investigative process. One sees the chronological progression suggested by the subtitle in which the crew is recognized as heroes for avoiding a catastrophic crash, and then portrayed as villains by the tunnel-vision investigators, and ultimately as blameless decades later. The book is quite technical at times and often way over my head. Corsetti is a professional pilot and perhaps overestimated the aeronautical background of the average reader. Or, perhaps the book was intended for those with far greater knowledge I in this regard. There are a few graphs and drawings in the beginning of the book, and it might have helped to include more and to have disbursed them throughout the book. In addition, many of the photographs and other graphics in the book were of poor quality, and sharper images with greater explanation may have helped. Despite that, “Scapegoat” by Emilio Corsetti, III, is a superb “truth is stranger than fiction” tale and a thorough exposé of a botched investigation. While TWA Flight 841 fell from the sky nearly 40 years ago, “Scapegoat” certainly provides lessons to be learned and heeded today.